In a previous communication I noted that my wife Paula and I were planning a three week journey/vacation up and down the California and Oregon coasts. It was an enjoyable and worthwhile experience, one that took me away from the daily routine of work longer than at any time in my career (although of course I still used electronic technology to keep connected and be as productive as time off would allow). It brought home to me again that taking care of physical and mental health is a fundamental responsibility, one that makes professional life possible. 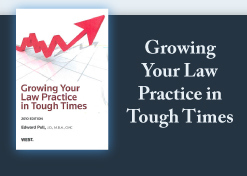 Certainly I know from my coaching experience that too many lawyers are close to burn-out or, at the very least, are unhappy in their day-to-day occupation. In fact, there are just too many reported cases of alcohol and drug abuse; how many such cases are not reported can only be left to the imagination. All successful people tend to work long hours and are focused on and passionate about what they do. In the effort to excel, made more intense by the pressure of economics, trying too much to succeed can cause problems for lawyers. Often, lawyers make the argument that they simply cannot structure their practices to be away for any length of time, but there are ample illustrations to the contrary. An effective tool of time-off management is to assure that you are allowed to have your vacation without surprise attacks from your opposing counsel. When in litigation, preparing and filing with the court (and serving opposing counsel with) a "Notice of Unavailability" will go a long way to prevent sudden motions or deposition settings when you plan to be out of town for more than a few days. This idea came to me in the late 1990s; it was not commonly used and most people never heard of it at the time. Since then, states as diverse as California, Florida, Georgia, New York and others seem to be aware of this procedure and some courts even have formal rules providing for it. Though still not widely discussed, this is a good technique to manage one's priorities and control one's own time for "renewal" (sometimes otherwise called "vacation") without worrying about someone back home seeking to take advantage of you and your client during your temporary absence from the office. Lawyers typically think they always know what needs to be done, and that they can do it if they just work hard enough and fast enough. That's asking far too much of anyone, and it often produces self-defeating fear and paralysis. A thousand-mile journey is nothing more than a series of steps; tools like a notice of unavailability enable you to take them one at a time. The New York Times had an interesting article about Lance Armstrong and his foundation, LiveStrong. Apparently, the foundation may suffer in its donation efforts because of the increasing focus on Armstrong for allegedly taking banned substances while racing. The French, according to one sports analyst, love an underdog, until he/she becomes a champion and then love turns to hate... until they retire. Then hate turns to love again. In Armstrong's case, perhaps the most tested athlete in the history of all sports, the French have been trying to convict him for years, but haven't been able to find any sample of his that was positive (for a banned substance). But, now the U.S. grand jury, convening in Los Angeles, may call him. Others have been called. All are seeking to uncover the "smoking gun." So far, it's only been "he said" by Greg LeMond and Floyd Landis, both admitted liars and very unhappy people. So far, to my knowledge, Armstrong has vehemently denied "doping" from the get-go and has never been under oath. Thus, at this stage, if he were to get into trouble, it would only be his arrogance that would give him trouble for, unlike Roger Clemons who recently was indicted for perjury, Armstrong has not committed any lie under oath. What would you do if you were his lawyer? What advice would you give one of the most celebrated sports celebrities? Would you advise him not to testify before a grand jury, even if contempt were a possible punishment, if he were to be called? Why can't we believe he was so good without taking banned substances? Just because Roger Clemons or Floyd Landis did doesn't mean Lance Armstrong did. At this stage, the end of Armstrong's racing career, the continued persecution (yes, not just prosecution) could do more harm to many people whose health issues could be compromised if the foundation faltered, even if one person were to be erroneously exculpated.